Looking for serious power from you 986 Boxster? Install the TPC Racing Boxster Turbo System for a gain of +140whp! Since it’s introduction, the Porsche Boxster has captured the hearts of Porschephiles all over the world. With its understated good looks, phenomenal chassis, and unmatched feedback, the Porsche Boxster has routinely been named one of the greatest drivers’ cars ever made. But the one thing the Porsche Boxster always lacked, was the power that it always needed to take the driving experience to the next level. When the 986 Porsche Boxster was introduced to the public in 1997, we got our first taste of true driving nirvana. Here was a small, mid-engined roadster with all the attention to detail and driving dynamics of the flagship 911, at a fraction of the price. Since then, the Porsche Boxster has been lauded as one of the best driver’s cars ever produced, even when compared to many far more exotic cars. The only complaint drivers have with the Boxster is with its anemic powerplant. With far less than 300hp on tap, Boxster owners were left wanting. Finally, TPC Racing is here with a solution for those on the hunt for HP. By providing drviers with an amazing 140whp and 100lb/ft of torque over stock, the TPC Racing 986 Boxster Turbo Kit(S/Non-S) is truely the ultimate 100% bolt-on turbo kit for the MY2000+ 986 Boxster. This amazing amount of power is achieved without any noticable turbo lag and with such smooth integration, that you’d swear the car came from the factory as a Boxster Turbo. The focus of TPCRacing is to find the perfect balance of power and reliability. That goal has been achieved and surpassed with the TPCRacing 986 Boxster Turbo Kit. Becuase of the immense amount of power this kit generates, many drivers have had the question: what effect does adding the Boxster Turbo Kit have on the engine’s overall reliabilty? The answer is that the TPCRacing 986 Boxster Turbo Kit has almost no adverse effects on the motor’s longevity. By running the kit at a very conservative 4.5lbs of boost, there is little added stess to the internal components of these extremely stout motors. Maintenance is very simple as well. We simply recommend oil changes be done once every 5000miles or once a year, whichever comes first. We also highly recommend that the oil is either Mobil1 or Redline or another hgh performance synthetic motor oil. In order to cool the massive amount of compressed air being fed into the Boxster’s engine, TPCRacing employs a liquid-to-air intercooler setup for maximum efficiency and ultimate power. This system works in conjuction with the OEM front center mount radiator. Whether you are facing hours of stop and go traffic, desert heat, or a weekend at the track; the liquid-to-air intercooler setup used in the TPCRacing 986 Boxster Turbo Kit will effectively manage intake air temperature. The TPCRacing 986 Boxster Turbo Kit completely replaces the stock exhaust system excluding the exhaust manifolds/catalytic converters. The exhaust included the TPCRacing 986 Boxster Turbo Kit produces a healthy rumble the will give you goosebumps. We went through many different designs during R&D to come up with a muffler setup that would produce an excellent tone while being perfect streetable. During normal driving conditions the exhaust maintains itself at a nice low rumble, but when the throttle is cracked open those around will know for sure that this is no ordinary Boxster. Made with aircraft grade stainless steel and polished to a shine, the exhaust in this kit provides an attractive and aggressive, sound and appearence with ZERO drone or resonance. Daily commuting with the TPC Racing 986 Boxster Turbo Kit is a pleasure. During normal driving conditions, the car performs like any stock Boxster; with very smooth throttle response and power delivery. The car is pleasant to drive as a daily commuter and in traffic it’s like driving a regular car. But as you press your right foot down a little harder, a whole new world opens up as the TPCRacing 986 Boxster Turbo transforms from a sedate street car into a firebreathing M3 killer. There is no turbo lag at all offering an astounding 75lb/ft of torque gain at only 3500 rpm, making it great when you just want to get up and go or for making lane changes with ease. This amazing combination of power and refinement makes the TPCRacing 986 Boxster Turbo the perfect car to race at the track during the day, and drive home in the evening. The secret to the amazing power and smoothness is our most advanced tuning system yet. The TPCRacing 986 Boxster Turbo Kit uses 6 larger injectors controlled by our cutting edge ECU flash. This technology helps us provide the most well integrated system on the market, giving the driver the feeling that their Boxster came from Germany as a factory Boxster Turbo. 1. Will I need to upgrade the fueling system to provide adequate fuel flow for the turbo kit? In order to provide adequate fueling for TPC Racing Cayman/Boxster S Turbo Kit, the OEM 27lbs injectors are replaced with uprated 60lb. motorsports injectors. No other modifications to the fueling system is necessary. 2. How do I tune the turbo kit once it is installed? TPC Racing Turbo Kits come standard with ECU Tuning included, so NO additional tuning systems are required. Once your ECU has been tuned by TPC Racing, it is a simple plug and play installation, and you are ready to go! 3. Will I need anything else for the installation, that is not included in the kit? If your vehicle is equipped with a 6speed manual transmission, it will be necessary to purchase a Front Center Radiator Kit for the Liquid-to-Air Intercooler system. This kit includes a TPC Racing Center Radiator, and all the necessary OEM mounting brackets. 4. What models Boxster will this kit fit on? The TPC Racing 986 Boxster Turbo Kit can be installed on any MY2000 or newer Porsche 986 Boxster. 5. I have/am interested in a vehicle with a built/swapped motor; can this kit be installed? All vehicles with built/swapped motors are considered “special projects” as they usually entail more than just a simple installation of the turbo system. All “special projects” must be discussed with TPC Racing’s engineering department. 6. Can TPC Racing Turbo Kits be shipped internationally? 7. Will my vehicle need any other upgrades (brakes/suspension/drivetrain/etc.) in order to handle the added power? All 986 models are required to upgrade to 987 style exhaust manifolds for installation of the turbo kit. 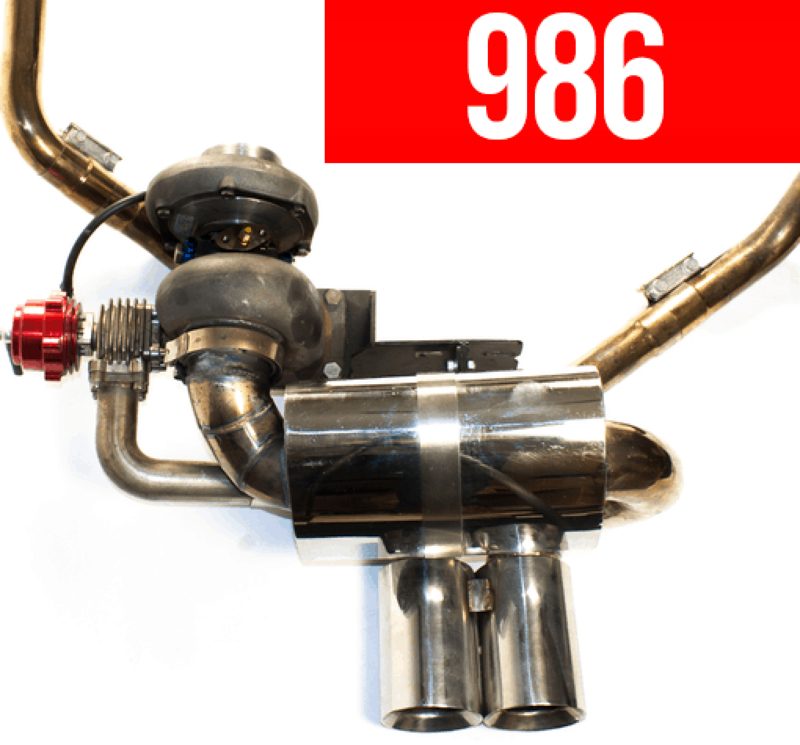 987 headers ARE NOT included with the the TPC Racing 986 Turbo Kit. In order to handle the added power of the turbo kit, the OEM clutch assembly will, at some point, need to be upgraded. We have many different options of clutch/flywheel upgrades depending on the application(track/street). 8. Are there any special maintenance procedures? As with all high performance vehicles, regular maintenance must be performed to help ensure the longevity and proper operation of all engine and turbo kit components. Oil changes must be performed every 3000miles, or once a year, whichever comes first, with a Porsche factory approved oil. For those who drive more aggressively or use their vehicles on track, oil changes should be done more frequently based on how hard you drive. 9. Will the turbo upgrade void my factory warranty? As with any aftermarket turbo kit, the TPC Racing Cayman/Boxster Turbo Kit will void your engine’s factory warranty. The rest of the vehicle will remain unaffected. 10. Can I use my aftermarket/stock exhaust in conjunction with a TPC Racing Turbo Kit? NO! 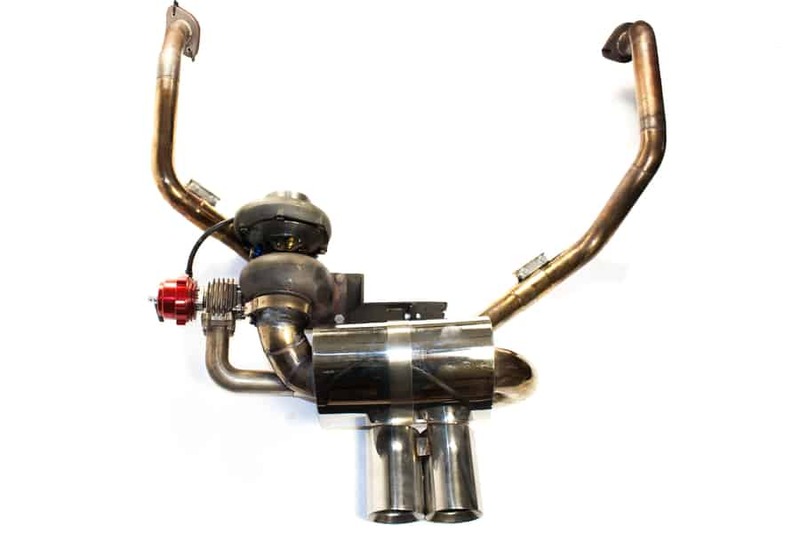 All TPC Racing Turbo Kits come with a full stainless steel exhaust system, specifically designed and engineered to work with the rest of the components of the TPC Racing Turbo Kit. 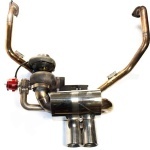 There are no aftermarket/stock exhaust systems that are compatible with a TPC Racing Turbo Kit. This is because when an aftermarket turbocharger system is added to a vehicle, the standard exhaust layout often times will not allow for integration of the turbocharger and related components. ***All 986 models do require some modification of transmission mounts. All 986 models equipped with Tiptronic transmission will also require relocation of the transmission oil cooler. **** – All WHP(wheel horsepower) figures are determined using a Dynojet Reseach Inc., 224x RWD dynomometer. All BHP(crank/brake horsepower) figures are estimated. In it’s early years, TPC Racing sought to initially satisfy the market’s need for more power, with our original TPC Racing Boxster Supercharger Kit. The kits were built around a small positive displacement supercharger, that gave the cars a healthy boost in performance. After several years on the market, this kit was discontinued due to rising costs and falling demand. Fast-foward a few years, and with the introduction of the new 987 generation, the 986 also began to see a resurgence, with a renewed interest from the performance aftermarket. Based upon our huge success with our 987.1 Cayman/Boxster Turbo Kits, we decided to redesign the kit for installation on the older 986 Boxster chassis. With a few changes to the system, and a couple of modifications, the TPC Racing 986 Boxster Turbo Kit was born! The TPC Racing 986 Boxster Stage1 Turbo Kit is the first step in helping the 986 Boxster reach its performance potential. With the ability to increase the Boxster’s performance by 80-90whp with a mere 4lbs. of boost, the TPC Racing Stage1 Turbo Kit, will immidiately transform your Boxster into a whole new machine! This is real performance that you can really see, feel, and hear! The focus of TPC Racing is to find the perfect balance of power and reliability. That goal has been achieved and surpassed with the TPCRacing 986 Boxster Turbo Kit. Becuase of the immense amount of power this kit generates, many drivers have had the question: what effect does adding the Boxster Turbo Kit have on the engine’s overall reliabilty? The answer is that the TPCRacing 986 Boxster Turbo Kit has almost no adverse effects on the motor’s longevity. By running the kit at a very conservative 4lbs of boost, there is little added stess to the internal components of these extremely stout motors. Maintenance is very simple as well. We simply recommend oil changes be done once every 5000miles or once a year, whichever comes first. We also highly recommend that the oil is either Mobil1 or Redline or another hgh performance synthetic motor oil. The TPCRacing 986 Boxster Turbo Kit completely replaces the stock exhaust system excluding the exhaust manifolds/catalytic converters. 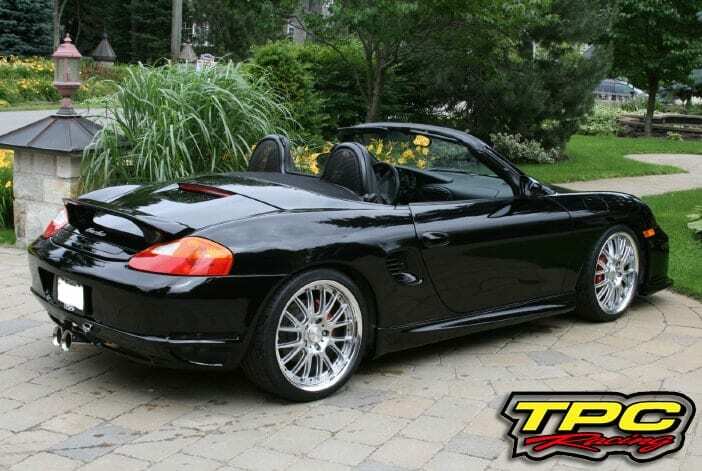 The exhaust included the TPCRacing 986 Boxster Turbo Kit produces a healthy rumble the will give you goosebumps. We went through many different designs during R&D to come up with a muffler setup that would produce an excellent tone while being perfect streetable. During normal driving conditions the exhaust maintains itself at a nice low rumble, but when the throttle is cracked open, those around will know for sure that this is no ordinary Boxster. Made with aircraft grade stainless steel and polished to a shine, the exhaust in this kit provides an attractive and aggressive, sound and appearence with ZERO drone or resonance. The Stage1 Turbo Kit for the 986 Boxster will require an upgraded set of 987 style headers for installation of the turbo kit. A 987 Throttle Body is also recommended for maximum performance, however it is not necessary. The TPC Racing 986 Boxster Turbo Kit can be installed on any MY2000 or newer Porsche 986 Boxster. Pre-2000 vehicles will require special installation in-house(not available for mail-order). Installation on the 986 Boxster will require modification to the factory transmission mounts. We are always looking for new/unique projects to take on, and have installed numerous systems on vehicles with non-standard motors. All vehicles with built/swapped motors are considered “special projects” as they usually entail more than just a simple installation of the turbo system. All “special projects” must be discussed with TPC Racing’s engineering department.